On 3rd June at Baku Expo Centre the 21st International Caspian Oil and Gas Exhibition and Conference started. 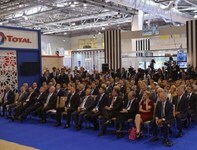 The largest event in the Caspian region’s oil and gas industry has attracted more than 400 companies from 29 countries. The Extraordinary and Plenipotentiary Ambassador of the USA to the Republic of Azerbaijan Richard L. Morningstar, who read a welcome letter to the participants of the Caspian Oil & Gas Exhibition and Conference on behalf of US President Barack Obama; The UK’s Prime Ministerial Trade Envoy to Azerbaijan Charles Hendry, who read a welcome letter on behalf of British Prime Minister David Cameron; The Deputy Minister of Petroleum and Energy Kare Fostervold, who read a welcome letter on behalf of Prime Minister of the Kingdom of Norway Erna Solberg; The Head of Mission of the European Union in Azerbaijan Malena Mard, who read a welcome letter on behalf of the European Energy Commissioner Gьnther Oettinger; and BP CEO Bob Dudley. After the opening ceremony the President of Azerbaijan toured the exhibition, visiting the stands of SOCAR, BP, Bos Shelf, SOCAR Turkey, GDF Suez, Saipem, RusNeft, TPAO, Statoil, Samsung, Caspian Shipyard, Federal Ministry For Economic Affairs And Energy of Germany, Halliburton, Sarvak Kish Engineering & Drilling Services. This year is a significant one in the history of Azerbaijan oil and gas industry, as the 20th anniversary of the signing of the Contract of the Century is being celebrated. The first Caspian Oil and Gas Exhibition and Conference opened in September 1994 on the eve of the signing of the Contract of the Century, which marked the beginning of a new period of development in the oil industry and the economy of Azerbaijan. At that time the initiative of holding the first specialized exhibition in the oil and gas industry in Azerbaijan was supported by the national leader, Heydar Aliyev. Since then, Caspian Oil and Gas has become a meeting place for leading professionals in the fields of oil, gas and energy, at which memorandums, agreements and contracts on future cooperation are signed. In the lounge of Baku Expo Centre the organizers have set up a special display dedicated to the anniversary of the signing of the Contract of the Century, its history and achievements. This year the exhibition will be attended by 402 companies from 29 countries. More than 70% of the exhibition space is occupied by world-renowned companies. Among them are the direct participants in the Contract of the Century: the State Oil Company of Azerbaijan Republic (SOCAR), BP, Statoil, TPAO and Lukoil, among others. Almost all of the exhibition’s debutants are using the event as a launch pad to expand their businesses in the Caspian region and have never entered the market of Azerbaijan before. The constant updating and expansion of the composition of the participants of the International Caspian Oil &Gas Exhibition emphasizes the unfading interest in it among the global oil and gas community. Local companies represent 35% of the total number of participants. Overall the exposition has grown by 10% since last year. 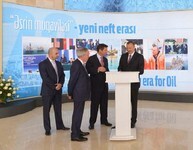 The exhibition occupies three pavilions of Baku Expo Centre. The exhibition consists of the following thematic sections: innovative technologies in the field of oil production and the transportation of energy resources, storage solutions for oil and gas, and existing and future oil and gas projects in the region. This year the exhibition’s platinum sponsor is SOCAR. The gold sponsors are BP Azerbaijan and Baker Hughes; and the silver sponsors are Nobel Oil Ltd. and Caspian Drilling Company. The bronze sponsors are Azfen JV, Tekfen Construction, Azeri MI Drilling Fluids, Bos Shelf, RussNeft, Caspian Marine Services, Ballast Pipelines SVAP Ltd., Dassault Systemes and SNF Vostok. The official car manufacturer for Caspian Oil & Gas 2014 is Toyota. 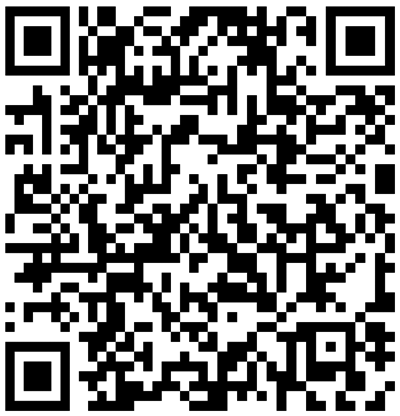 The exhibition is organized by ITE Group Plc and Iteca Caspian LLC. We would like to note that the partners of ITE Group Plc -ITE London, ITE LLC Moscow (Russia), EUF (Turkey), GIMA (Germany), ITE China (PRC) and ITE Gulf (UAE)- have actively attracted international companies to participate at the Azerbaijani exhibition.